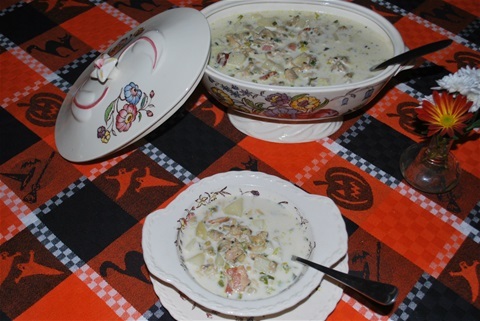 Yesterday was Fat Tuesday and looking at all the folks on Channel 7 News who were enjoying Mardi Gras in New Orleans, freezing while they were being festive, made me want some clam chowder. Well, that and my friend Adriane Terrell mentioning that she was going to make the clam chowder out of my book, Tablespoon of Love, Tablespoon of Laughter. That made me realize I really really want some so I thought I’d share with you dear friends. I love clam chowder. The white (Boston) kind as opposed to the red (Manhattan) kind. Actually, I really like that kind, too. But today we’re talkin’ Boston! Anyway, I really do love it, especially when I can find a few clams in it and it’s not made totally of something resembling wallpaper paste! This version is not so thick you can eat it with a fork, and I think it’s awesome. It’s easy to make and doesn’t take all day to do. Cook the bacon in a 5 to 6 quart pan over medium heat until crisp. Stir occasionally. Discard all but about 3 Tb. of the drippings then add the celery and green onions. Cook, stirring often, until onions are limp. Stir in the clams and their liquid, broth and potatoes. Bring to a boil over high heat, then cover, reduce heat, and simmer till potatoes are tender to bite, about 10 minutes. Stir in the half & half and season to taste with pepper. Heat till steaming but not boiling. This smells incredible, by the way! Garnish with parsley and serve with some garlic bread. Notice, no flour was involved in any way! Here it is in my grandmother’s soup tureen, looking pretty good if I do say so myself!